A promissory note, or “promise to pay”, is a note that details money borrowed from a lender and the repayment structure. The document holds the borrower accountable for paying back the money (plus interest, if any). There are 2 types of promissory notes, secured and unsecured. A secured note is an agreement for borrowed money with the condition that if it is not paid back to the lender then the security, which is usually an asset or property, is turned over to the lender. Therefore, an unsecured note is an agreement for borrowed money although does not have any assets or property listed as collateral if the note goes unpaid. Secured Promissory Note – For the borrowing of money with an asset of value “securing” the amount loaned such as a vehicle or a home. If the borrower does not pay back the amount within the time-frame suggested the lender will have the right to obtain the property of the borrower. Unsecured Promissory Note – Does not allow the lender to secure an asset for money loaned. This means that if the payment is not made by the borrower that the lender would have to either file in small claims court or through other legal processes. I Owe You (IOU) – A receipt acknowledging a debt that is owed with no timetable for payment. Loan Release Form – When the note has been paid-in-full, the lender should set the borrower free of all liabilities by authorizing a release form. Promissory notes are a do-it-yourself contract that you fill out to “promise” payment to an individual or bank by a certain deadline. It’s sort of like a more detailed and legally-binding IOU. They’re important for holding the borrower accountable for paying back a loan from a private investor or bank. They are also useful for keeping documented records of the loan for all parties involved and for tax purposes. A Promissory Note is a legally binding document so it makes sense to want to do it right the first time. Unlike most contracts, promissory notes aren’t typically long and complicated and rather short and simple. Therefore, the lender and borrower don’t necessarily need legal knowledge to be able to fill one in. Amount ($) – The amount of money being borrowed. Interest Rate – In other words, the fee for borrowing the money (See How to Calculate). Make sure to check the Interest Rate Laws in your State (or “Usury Rate”). All States have a maximum amount of interest a lender is able to charge. Late Fee(s) – In the case there will be penalties for late payment. Security – Items such as vehicles or a 2nd mortgage on a home is provided if the borrowed money is not paid back by the borrower. This is to provide assurance to the lender that their money will be paid-back either in cash or assets. Terms of Repayment – Will the payments be made incrementally or as a lump sum? Default Clause – Provide terms in the chance the money is never paid back by the borrower. 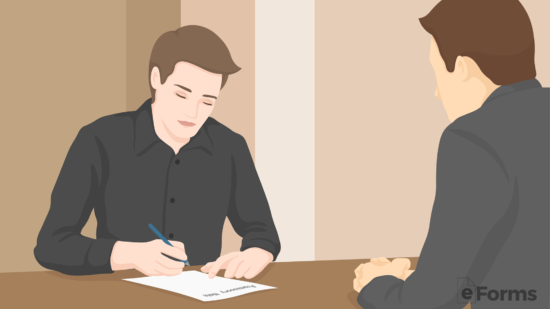 Co-Signer – If the borrower is not financially capable of borrowing the money a 2nd person should be named to pay back the loan if the borrower cannot do so themselves. It is always a good idea to run a credit report on any potential borrower as they may have outstanding debt unbeknownst to you. Especially if the debt is IRS or child support related it will take precedence over this promissory note. Therefore, it is imperative that a credit report is run before making any type of agreement. Reporting Agencies – It is a good idea to use Experian which is free to the lender and charges $14.95 to the borrower. 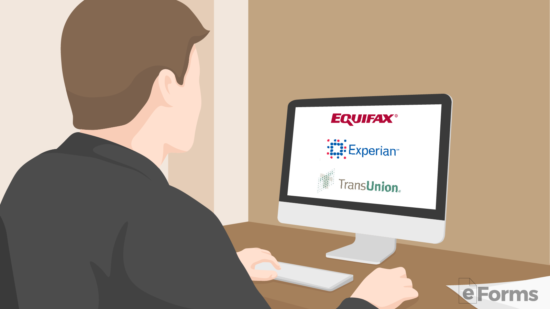 Experian is known as the most sensitive credit agency usually providing the lowest score of the 3 Credit Bureaus (Experian, Equifax, and TransUnion). Authorization Form – In order to run someone else’s credit, you must obtain written legal permission. If there are red flags that appear on the credit report the lender may want to have the borrower add Security or a Co-Signer to the note. Common types of security include motor vehicles, real estate (provided as a 1st or 2nd mortgage), or any type of valuable asset. This would mean that in the event the borrower did not pay back the funds that the lender would be able to obtain full ownership of the security placed in the note. In the case of a co-signer, he or she would be liable for the full extent of the money owed along with all penalties or late fees. After the main terms of the note have been agreed upon the lender and borrower should come together to authorize the formal agreement. For instructions on how to fill in the document line-by-line refer to the How to Write section. 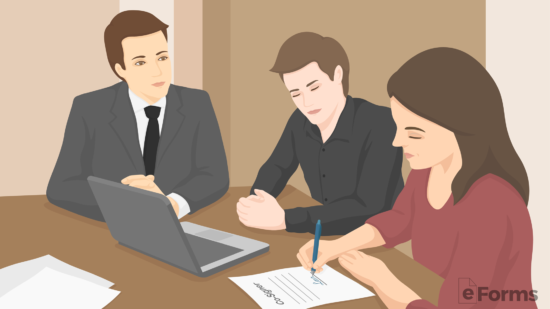 Signing – The money should exchange hands after it has been signed. It is not required that a witness sign the form but is recommended. For excessive amounts (more than $10,000) a notary public is recommended. The borrower should pay back the borrowed money on-time and in accordance with the note. If not, fees may be applied to the overall balance. Once all the money has been fully paid back to the lender a Loan Release Form is created and issued to the borrower relieving them from any liability from the note. If Payment is Late – If the payment is late the lender should issue a Demand Letter. 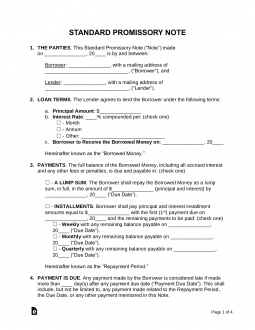 This is a form that informs the borrower of the terms stated in the promissory note such as the penalty for late payment as well as how much time they have before they become in default. If Borrowed Money is Never Paid – If the borrower defaults on the note then the lender can collect by minimizing their costs by seeking the funds through Small Claims Court (Small Claims is usually limited to a value of $10,000 or less, be sure to check the laws in your jurisdiction). If there was security placed in the note then the property or asset shall be turned over to the borrower in accordance with the note. Otherwise, legal action will most likely be necessary for money owed in value of more than $10,000. It’s important to lay out all the numbers in the promissory note so that there’s no confusion between you and the beneficiary. The final total payout, total interest, and monthly payments are all things that you’ll need to include. To calculate these, you’ll need to know the principle being loaned, the length of the repayment period, and the annual interest rate. Here are the formulas you can use. First I would want to calculate the interest rate over a year span which would be $100 ($1,000 times 10%). Then I would divide the $100 amount by 4 (as there are 4, 3-month periods in a year) and I would arrive at $25 as the total interest owed I would need to pay over the course of 3 months for borrowing $1,000. The final payment amount would be $1,025. First I would want to calculate the interest rate over a year span which would be $100 ($1,000 times 10%). Then I would divide the $100 amount by 4 (as there are 4, 3-month periods in a year) and I would arrive at $25 as the total interest owed. Then we would add the Money Borrowed of $1,000 to the $25 of interest due which equals $1,025. Since there are 3 months we would divide $1,025 by 3 and the monthly payment amount would equal $341.67. Also known as the maximum rate of interest a lender can charge. It’s important that Lenders do not charge a rate of interest more than what their state allows. The following are links to each state’s Usury Rate Laws. Below are common Key Terms (definitions) and Clauses found in our Promissory Note. Allocation of Payments – Describes how payments shall be made in regards to late fees, interest, and the principle. In our free promissory note, payments shall first pay off any late fees and interest before the principle is credited. Prepayment – A clause detailing the rules of paying off the loan early, whether it’s the entire loan or individual payments. Some loans may require that the borrower pay a fee in order to “prepay” the loan. Acceleration – In the event a borrower defaults on the note or on a provision within the note and does not cure the default within the allotted time frame, the lender has the option to demand immediate payment of all outstanding dues from the borrower. Attorney’s Fees and Costs – The borrower must pay all monies incurred if defaulting on the loan results in the involvement of attorneys and court proceedings. However, if the borrower ends up prevailing in court, no matter the issue, the lender must then pay for all court-related costs. Waiver of Presentments – This is a short clause that implies that the lender does not have to demand payment when payments or the loan is due, the borrower holds the responsibility to make certain that the payments are paid when due. If the borrower does not pay when due, the lender must issue a notice of non-payment. Further, if the borrower refuses to pay the note, the lender shall have the notice of non-payment presented and notarized which may follow with legal proceedings. Non-Waiver – If for any reason the lender fails or delays to exercise their rights under the terms of the note, it does not signify or deem that they are waiving their rights. For example The lender delays in responding to the borrower about an upcoming payment due. The non-response by the lender does not give the borrower the right to not make payment on the due date. Severability – A clause within a promissory note which states that if any provision within the note becomes void or unenforceable, it does not deem the entire note or any other provision within the note invalid. Integration – States that no other document can affect the terms or validity of your promissory note. Only can your promissory note be amended (edited) if both the lender and borrower sign a written agreement. Conflicting Terms – States that no other agreement shall have superior legality or control over your promissory note. Notice – Describes how notices should be delivered to the borrower. It is standard practice for notices to be written and to be delivered either in person or by certified mail with copies and receipts. Co-Signer – A person who guarantees the loan if the original borrower defaults on the note. 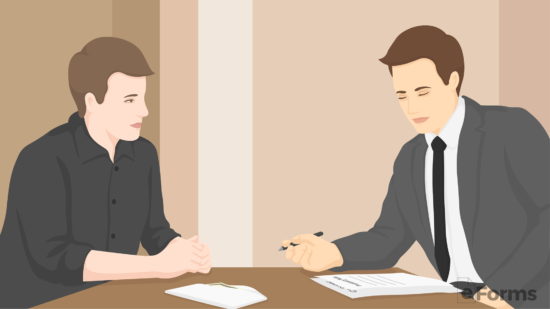 Typically if the lender suspects a borrower to be risky, the lender may require the borrower to obtain another credible person to co-sign on the note. Execution – States that the borrower is the Principal within the note and severally liable for all dues. If there is a co-signer, both the borrower and the co-signer are equally responsible for paying back the loan. Compared to other types of contracts and legal forms, a Promissory Note is far easier to understand. Most people, without any sort of legal knowledge, can understand the basics of this document and fill out on their own behalf. 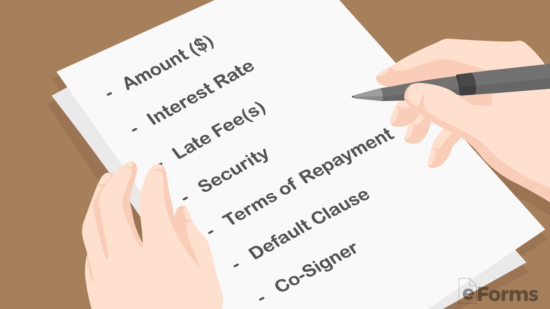 Below we show you how to complete our basic promissory note. This example will take place in the state of New York. Complete the Date by entering the day, month, and year. Proceed by entering the name of the Borrower and Lender. Follow with both of your mailing addresses (can be a personal or company address). The lender must enter the principal amount of the loan in both words and numbers. Submit the interest rate (percentage annually). In this example, we entered 16% because in the state of New York, 16% is the maximum allowed interest rate a lender can charge. Complete the Date by entering the day, month, and year that the full balance of the loan is due. Include interest and late fees (if any). You then have two options to select from – Paying back the loan with a Lump Sum or by Installments. Check the box indicating the agreed frequency of repayment and enter the amount. In our example, we chose Monthly Installments. Since the loan is being charged 16% interest, the borrower will have to make payments every month in the amount of $97 dollars. If you have selected Installments as your repayment option, enter a Late Fee amount in the event the borrower does not make their payments on time. In our example, we opted to make the late fee at a reasonable $25 dollars. As a Lender, the safest type of promissory note to use is by selecting “Secure“. Most pawn shops use this method. In our example, the borrower has used their iPhone 7 as collateral to secure the loan with the Lender. In the event the borrower can’t pay back the loan, the Lender will keep the iPhone 7. When planning to loan money to an individual or business, select “Unsecure“. It’s important to have some level of trust in your borrower if you plan to issue an unsecured note. Having a Co-signer ensures the loan will be paid back by another person even if the original borrower faults on the loan. You often see co-signers with Unsecured Promissory Notes due to the absence of collateral. In this example, we selected “No-cosigner” since the borrower took out a secured loan by using his iPhone 7 as collateral. This is fairly an easy step. Simply enter the state that will govern your note (loan). This is particularly important due to the Usury Rates differing by state. The state of the individual or business lending the money (the lender) should be entered. In this example, the lender resides in New York, therefore the state of New York was entered. The lender, borrower, and a witness should all come together when the time comes to sign the note. If there happens to be a co-signer, notify that person to be present as well. Each person must sign, date and print their name in the presence of the witness.